Celebrate fresh ingredients with this Farmers Market Corn Toss recipe. 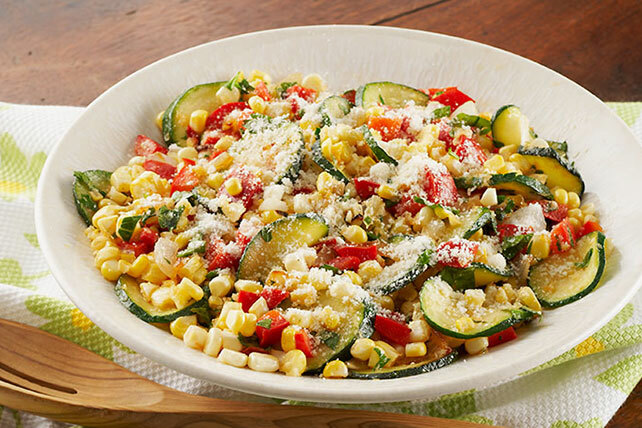 Zucchini, red peppers and onion are the perfect companions to farmers market corn. Heat oil in large skillet on medium heat. Add onions and red peppers; cook and stir 3 min. Stir in corn and zucchini; cook and stir 5 min. or until all vegetables are crisp-tender. Remove from heat. Stir in parsley, black pepper and 2 Tbsp. cheese. Prepare using 2 small zucchini.